Mentha piperita L. Pharmacopoeial name: Mentha piperita. Other common names: American mint, brandy mint, lamb mint, lammint, State mint (in New York). Habitat and range: Peppermint is naturalized from Europe and is found in damp places from Nova Scotia to Minnesota and south to Florida and Tennessee. It is largely cultivated, principally in Michigan and New York, where the distillation of the plants for the oil is carried on commercially on a very extensive scale, and also in parts of Indiana, Iowa, and Wisconsin. 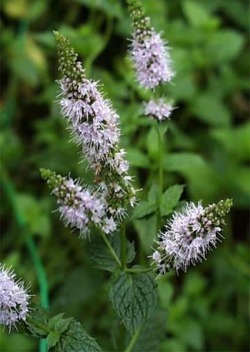 Description: Pepper-mint propagates by means of its long, running roots, from which are produced smooth, square stems, from 1 to 3 feet in height, erect and branching. The dark-green leaves arc borne on stalks and are lance shaped, 1 to 2 inches in length and about half as wide, pointed at the apex and rounded or narrowed at the base, with margins sharply toothed; they are smooth on both sides, or sometimes the veins on the lower surface are hairy. This aromatic perennial of the mint family (Menthaceae) is in flower from July to September, the small purplish blossoms havinga tubular, 5-toothed calyx and a 4-lobed corolla. They are placed in circles around the stem, forming thick, blunt, terminal spikes. Collection, prices, and uses: The dried leaves and flowering tops are the parts directed to be used by the United States Pharmacopoeia. These must be collected as soon as the flowers begin to open and should be carefully dried in the shade. Dried peppermint leaves and tops bring about 31/2 to 41/2 cents a pound. The pungent odor of peppermint is familiar, as is likewise the agreeable taste, burning at first and followed by a feeling of coolness in the mouth. It is a well-known remedy for stomach and intestinal troubles. The oil, which is obtained by distillation with water from the fresh or partially dried leaves and flowering tops, is also official in the United States Pharmacopoeia. While a less acreage was devoted to peppermint during 1910, conditions were favorable to its growth, and the crop is estimated to have amounted to about 200,000 pounds. The wholesale quotations for peppermint oil in the spring of 1911 ranged from $2.85 to $2.95 a pound.